Digimon Frontier: Revival of the Ancient Digimon (デジモンフロンティア 古代デジモン復活！！ Dejimon Furontia Kodai Dejimon Fukkatsu!!) 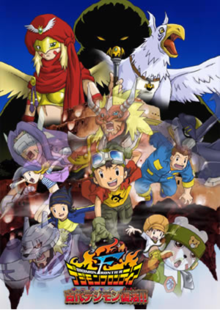 is the seventh Digimon movie and is the only movie of Digimon Frontier (Dub: Island of Lost Digimon). It premiered on July 20, 2002 alongside Kinnikuman Nisei: Muscle Ginseng Competition! The Great Choujin War (キン肉マンＩＩ世 マッスル人参争奪！超人大戦争, Kinnikuman Nisei Massuru Ninjin Soudatsu! Chōjin Daisensou) and Fierce Fighting! Crush Gear TURBO: Caesarvern's Challenge! (激闘！クラッシュギアＴＵＲＢＯ カイザバーンの挑戦, Gekitou! Kurasshu Gia Tābo Kaizabān no Chousen) during the 2002 Summer Toei Anime Fair. The Children travel on a Trailmon when they suddenly land on The Wandering Island. Takuya, Tomoki, Junpei, Bokomon and Neamon awake on the stairs and meet Kotemon. Suddenly Beast type Digimon, led by Hippogriffomon, attacked Human type Digimon, led by Darcmon, by tanks. Takuya and others got over the battle and went to the place where there were Kotemon's friends. At the same time, Bearmon helps Kouji and Izumi. The children unite again. The Digimon explained that Human Digimon and Beast Digimon of the island opposed to each other. 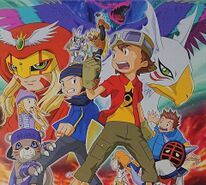 They showed the children to the cave where there was huge wall painting of Ornismon, an ancient Digimon, on the wall. Ancient Greymon and Ancient Garurumon were painted on both sides of Ornismon. Suddenly Beast Digimon and Human Digimon started to fight. The children felt it's very meaningless battle. Takuya evolved into Agnimon and Kouji evolved to Garmmon to stop the battle. That night, the battle started. Takuya evolved into Vritramon and Kouji evolved into Wolfmon and tried to stop the battle. Meanwhile, The other children were collecting the stones in the cave to read the message. Then Kotemon found a hole under Ornismon's painting that sees to be the item of Darcmon and Hippogriffomon. Junpei and Izumi accidentally sees Darcmon change into Hippogriffomon in the alley. Izumi and Junpei evolved and they told the secret to everyone. Then Hippogriffomon came and Slide Evolved into Darcmon. She fitted her stick into the hole revived Ornismon. It was soon discovered that Darcmon is actually Murmukusmon (the Digimon who has the power to disguise himself as whichever Digimon he wants). They started destroying the island. The children tried to fight but Ornismon was too strong. Suddenly Ancient Greymon and Ancient Garurumon appeared thanks to Kotemon's sacrifice and the children destroyed Murmukusmon. The Ancient Warriors defeated Ornismon and returned the Children to the Digital World. This page was last modified on 17 June 2018, at 04:39.